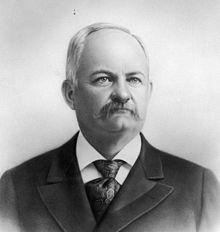 Caleb Walton West (May 25, 1844 – January 25, 1909) was an American politician and Governor of Utah Territory twice, 1886–1888 and 1893–1896. Born in Cynthiana, Kentucky in Harrison County, Kentucky, he was a Confederate veteran and a municipal judge in Kentucky. He was the last Governor of Utah before statehood. "Index to Politicians: West to Westbrook". The political Graveyard. Retrieved March 17, 2011. McMullin, Thomas A.; Walker, David (1984). Biographical Directory of American Territorial Governors. Westport Connecticut: Meckler Publishing. pp. 307–308. Tullidge, Edward W. (1886). History of Salt Lake City. Salt Lake City: Star Print Company. p. 60. Retrieved March 17, 2011. This Utah biographical article is a stub. You can help Wikipedia by expanding it. This page was last edited on 24 December 2018, at 21:55 (UTC).